Superman, who’s been running hot & then cold with the new team. Voiced by George Newbern. The Elite: Manchester Black, Coldcast, Menagerie/Pam, and The Hat, who’ve risen in popularity lately. Voiced by Robin Atkin Downes, Catero Colbert, Melissa Disney, and Andrew Kishino, respectively. The Atomic Skull, the radiation-powered supervillain. Although basically still the same, he’s quite obviously bigger (possibly eight feet tall or more), badder and a whole lot more dangerous, not to mention pissed off. The Setup: During Atomic Skull’s incarceration he’s been hooked up to a reactor, siphoning off his unlimited energy supply and using it to generate free electricity for, apparently, a sizable portion of Metropolis. Unfortunately some sort of power outage/surge brings the whole system down (seems flimsy) and he’s escaped, looking for blood. Meanwhile, since their initial meeting, Superman and the Elite’s relationship has deepened. He sought them out and received a brief history from Black, then the five were brought together in an impromptu rescue mission as they worked together to save the victims of a terrorist attack on the Chunnel. After that, however, Superman has been increasingly troubled by the group’s methods, not to mention their attitude– they’ve already fatally intervened during the most recent flare-up in the Middle East. Superman is out in Smallville, grousing with Pa Kent, when Lois calls with the word that the Skull is stomping around Metropolis. The Fight: Although Superman speeds off, it’s the Elite who arrive first– just in time to save Lois & Jimmy from getting crushed by a falling car, actually. Seeing on the news that his new heroes the Elite are in town, Efrain Baxter’s rebellious son, Terence, runs off to see the action in person, with dad in pursuit. The Elite’s cocky attitude fails to impress Atomic Skull– he dismisses them as “the interns” before scattering them with a major blast. He easily shrugs off Menagerie’s counter-attack and beats on Coldcast pretty hard. Black catches him with a telekinetic surge and gets assisted by an arriving Superman. The two rivals slug it out pretty hard, but Skull’s time away has improved his power so much he’s able to uppercut Superman into the sky and through several buildings. Manchester is left alone with Skull, and when they go head to head, Black’s telekinesis against Skull’s radioactive energy, the Brit is no match, and gets knocked back pretty hard. He’s saved by a returning Superman, but when Skull gets the upper hand again and unleashes another devastating blast on the hero, the resulting shockwave kills several people in the nearby area… including Efrain Baxter, absorbing the pulse that would have hit his son. He’s turned into a statue of dead ash right before Terence’s eyes. Superman recovers and, buying some time by blasting Atomic Skull with his heat vision, orders the Hat to form a perimeter and prevent further collateral damage. The Hat– whose vast abilities are apparently only useful under close supervision, because he’s been sitting around uselessly up to this point– complies by summoning up a bunch of huge terracotta warriors to scare away pedestrians. He also asks if Coldcast can absorb energy as well as direct it, which he can. Though Black bristles at Superman taking charge of his team, everyone sort of silently agrees to a loose plan where four of them take turns hitting the Skull with harassing attacks while Coldcast finds an opening to get in close. This is probably the best part of the fight, with each superpowered titan having a quick skirmish with the villain before getting batted away, only to get replaced by another hero. The Skull is one heck of a blunt instrument, but he’s quickly outclassed by a coordinated effort. And when Coldcast lunges in and lays hands on the beast, there’s little he can do (thanks to Superman and Pam holding down his limbs) to resist as his excess energy is leeched out, leaving him shrunken and helpless on the ground. The aftermath, however, is what’s important. 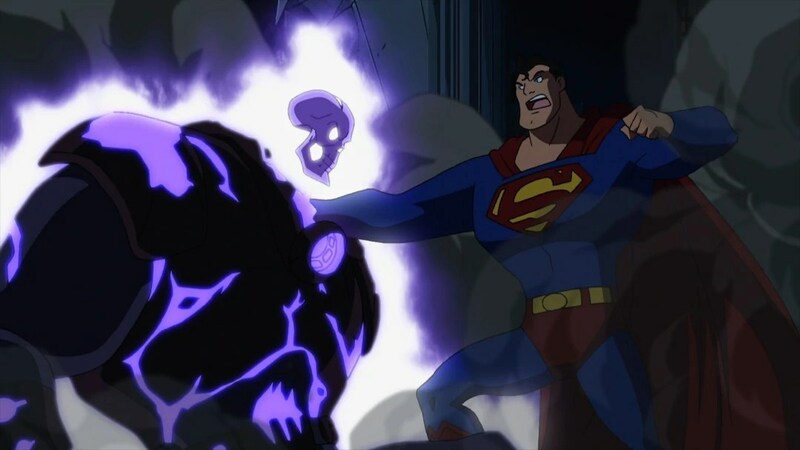 Black wants to execute Skull on the spot, which Superman naturally resists. But it’s Terence Baxter who turns the whole crowd against the rule of law, as he urges Black on and blames Superman for his father’s death, saying that this wouldn’t have happened if the hero had put down the Skull for good last time. With the mob’s approval, Manchester sends a point-black psychic pulse that explodes Atomic Skull’s skeletal head– Superman just barely fails to stop him, as he’d stepped away from Black to console Terence. The vigilante group quickly teleports out, leaving Superman to cover up the corpse of the person he’d failed to save. A lot of improvement here. The Skull’s dramatic change in appearance and his casual murder of even more innocents– notably Baxter, who we’ve gotten to know a bit by this point– really raise the stakes. This isn’t fun & games, people’s lives are on the line. Things get ugly and desperate enough here that it’s less like a superpowered romp and more like a war. Unlike the previous tussle with Skull, it’s set at night, which is a rather simple but effective way to accompany the thematic with a literal one. And the staging is subtly different: unlike the city-spanning and building-hopping antics of last time, this all goes down on, basically, one street, making for a more tight and intimate feel. The music score (by Robert J Kral) is exciting but plays out in a slow, moody, rhythmic and low-key way, conveying an ever-growing dread. 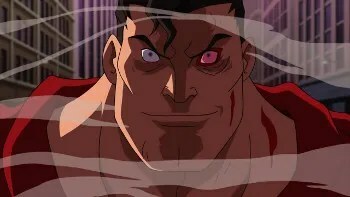 By the end of the fight, you yourself hate the Skull and rather feel like killing him– when Superman cries out for restraint you see it being almost as pathetic and ineffectual as the crowd in the movie does… yet simultaneously, you pity him. You know the deck is stacked against him, that this is the time when principles are tough to hold onto. We’ve all been there. Superman is left alone in many senses of the word. Pretty dark. Coming Attractions: It gets darker. This entry was posted in Superman vs The Elite and tagged melee, superheroes, Superman, Superman vs The Elite.